This account of a trip (mostly pleasure, a little business) from rural Berks-Montgomery County to the city of Philadelphia was written by 15-year-old Enos Gehman in 1871. Over a hundred years later it was published in the MHEP Newsletter April 1978, and is now republished here, with photos added from the collection of the Free Library of Philadelphia. Oct. 4, 1918 – The funeral of Enos S. Gehman, one of the most prominent men in this locality, was largely attended. Dinner was served to 443 people, and upwards of 400 automobiles were on hand. Deceased was born Sept. 1, 1855. He was a son of J.L. and Elizabeth (nee Stauffer) Gehman, who resided on the old Gehman homestead now owned by William Gehman. Deceased taught school for two years at what was known as the paper mill school house, 1874-76. Then he learned watch making with Jonathan Ehst, at Boyertown, 1876-81. He conducted this business at Clayton for a number of years at what is now Sidney Borneman’s home. In Bally he was engaged at this trade until three years ago. Then his sons, Eli and Harvey, succeeded him. He was active in church and Sunday school work. The MHC holds a bookplate made for Enos, donated by grandson Melvin Gehman (1990.8.13), and an unfinished plate in the same style for his sister Anna, along with other family papers (Hist. Mss. 49). It’s possible the plates were made by Enos himself as a young schoolteacher, following the fraktur tradition of older Pennsylvania German schoolmasters. One bright Tuesday morning last spring, as I was awaked, my father said we want to take a journey to Philadelphia, I was glad to hear that, then we went out in the barn fed the horses, and curried them, took our breakfast, and made ready and went up to Mt. Pleasant Station, there we took a train and went over to Pottstown Station, there we changed trains and went down to Philadelphia, then it was half past ten O’clock A. M. and went up in the steeple of the State house [Independence Hall, pictured at left as it appeared in 1873], where we have seen the greatest part of the city and the large clock struck eleven, then we went down to the Black horse hotel, where we took our dinner, then we went down to the mint, there we went in, where a man was which took us around in the whole house and showed us where they make money, then went up on the top of the Girard College, and went back again to the hotel where we took our supper, then went out again in a circus where they were riding on horses, and acting so that I could not see how they made it, went back and went to bed, and were sleeping good till morning, then we awaked again, took our breakfast, and went down to the Delaware river, there we got in a steamboat and went over to New Jersey, soon went back again to Philadelphia, and bought two barrels of fish, then went back to the hotel, took our dinner, then took our fish to the depot, put them in a train, and we took a train too, went up again to Pottstown, changed trains and went back to Mt. Pleasant, there was my brother ready with a wagon to put the fish on, then we put them on it, and went home, then it was half past nine Oclock, and I went to bed and was sleeping good till morning. Day 1: The U.S. Mint at Chestnut and Juniper, which Enos Gehman and father John toured after coming down from the State House steeple. Photo taken circa 1902, just before the building was demolished. 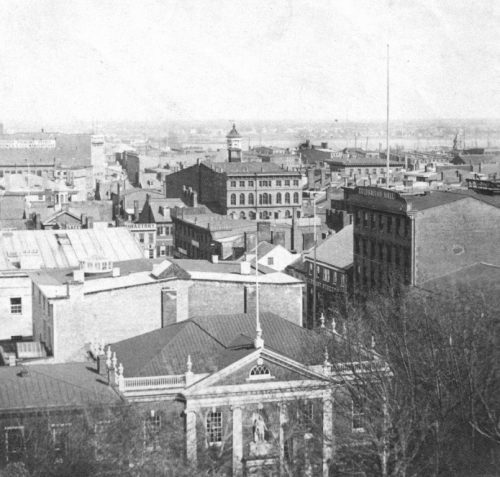 Philadelphia’s distinctive city hall, visible behind the mint, began to be constructed in 1871, just after Gehman’s visit. Credit: Photographic Prints. Free Library of Philadelphia. Day 1: “…then went up on the top of the Girard College….” Girard College is situated on a rise, with an excellent view of the city, as depicted in this engraving by G. G. Lange, circa 1850. Credit: Scrapbooks. Free Library of Philadelphia. Day 1: A circus building in Philadelphia, circa 1890. The circus attended by Enos and John Gehman on the evening of their first day in the city was probably, like this one, in a building rather than a tent. The paintings on the building depict acrobats doing tricks on horseback. Credit: Castner Scrapbook v.2, Theatres, page 11. Scrapbooks. Free Library of Philadelphia. Day 2: “…we got in a steamboat and went over to New Jersey….” This photo, circa 1870, depicts a pleasure steamboat on the Schuylkill River at Fairmount Water Works, perhaps similar to the boat the Gehman’s took across the Delaware River. Credit: Albumen Prints. Free Library of Philadelphia. Day 2: When Enos and his father returned from their boat ride to New Jersey, they purchased two barrels of fish, probably at a warehouse like this one at Race Street Wharf, photographed circa 1856 by William Herman Rau. Credit: Castner Scrapbook. Free Library of Philadelphia.